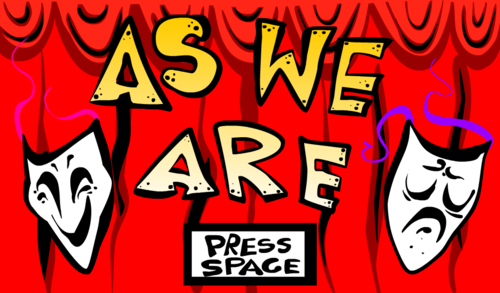 As We Are is a short 5-minute puzzle game where you explore a situation from several different character’s viewpoints. It’s our entry to the 2014 global game jam. I’m quite pleased with this self-contained little game. It’s simple (you just move around with the arrow keys) but is able to present comprehensible situations via puzzles (thanks to a combination of the I’m-quite-proud-of level design and clear visual style). I made a couple of huge layout oversights (incl. one that lets you just skip 50% of the puzzle) but I think they actually ended up adding to the experience. 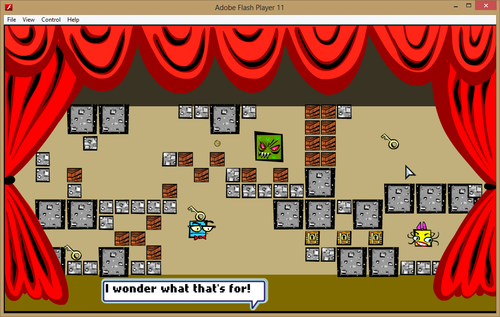 The alternate paths let you feel clever if you find them, and help people who get stuck continue through the game. Sure, there’s a couple of other rough edges (no clear instructions to use space when you’re a dragon, NPC item stealing noise loop, you occasionally catch on the edges of things, I really wish I had added another level after the first where you play as one of the pink ‘bros), but I am legitimately proud of this. It feels whole. This entry was posted in Other Projects and tagged game jam, gamesimade, ggj2014, puzzle games. Bookmark the permalink.